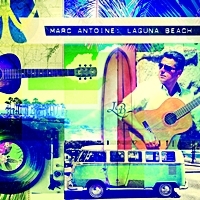 Veteran Smooth Jazz acoustic guitarist delivers yet another fine album with ‘Laguna Beach’. At times, his playing is exquisite drawing on his flamenco roots. Tunes like the Latin flavoured ‘Romantico’ and ‘New Morning’ are just gorgeous. ‘Deixa’ is a lovely Bossa tinged shuffler ‘Minority’ is a gritty mid-tempo groove. Guests include Phillipe Saisse, Rick Braun and Paul Brown. Quality.